The Alaska Department of Fish and Game highlighted in a video the devastating effects of debris on sea lions and seals. Horrific images show the marine animals with their necks tightly bound and cut with bands and fishing nets and others with fishing lures hanging from their mouths. 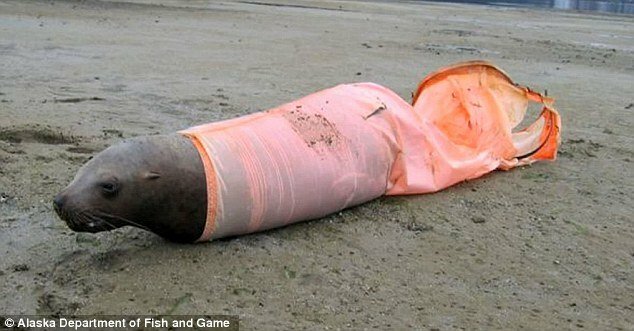 In one of the more gruesome images a dead sea lion can be seen pinned by her flippers in a windsock, which led to her drowning. It is thought that many of the animals become trapped in plastic bands when they are young. But as they get older and grow, the bands slowly cut into their bodies, which can lead to strangulation. The Alaska Department of Fish and Game released the video to highlight the effects of fishing gear and other debris on the animals. Authorities in Alaska – who say they are underestimating the numbers of animals injured – are now looking to work more closely with the fishing industry to prevent sea lions and seals becoming trapped in debris. A study of eastern Steller sea lions, which are threatened by extinction, was carried out between 2000 and 2007 along the coast of Alaska and northern British Columbia. The study revealed that 386 animals had picked up debris. Plastic packing bands – used to secure boxes – and rubber bands were found to be the most common items which ended up around the necks of the animals. Metal flasher lures, which are used when fishing for salmon, were the most frequent fishing gear ingested. “We are certainly underestimating the number of animals entangled. Researchers say they could have missed counting some of the animals which didn’t come to shore or were not visible in a crowd of sea lions. The horrific effects of sea debris also affect other marine wildlife, including sea birds and turtles. As well as the Steller sea lions, northern fur seals also become regularly entangled. Although the researchers found that they don’t swallow as much fishing gear as the Steller sea lion, they do get bands trapped around their necks. The Alaska Department of Fish and Game is now looking for funding to work with the fishing industry to help prevent the sea lions and seals from becoming trapped in fishing equipment. People are also being encouraged to cut loops which are thrown into rubbish bins.